Interesting mention of PCM+, if I had to guess I would imagine that is an enlarged version of the PCM when HESS comes along. Also, why not have the Recoverable return module return racks as well? Seems like an asset NASA would want especially if a rack malfunctions and needs to be repaired on the ground rather than rebuild another and trash the previous one. They would only have to return a component of the rack and not the whole thing. Hmmm... very interesting, antonioe... I read the presentation someone linked about using the Cygnus for servicing, and it mentioned refueling... How much fuel could a refueling Cygnus carry? 2 tons? 3 tons? Maybe more, if launched on a bigger launch vehicle? Sounds like an excellent bus for a tanker, or perhaps for picking up passive cargo in LEO and delivering them to a LEO depot or station. Could Cygnus be used as a tug for ULA's Payload Bay Fairing? Also, the presentation mentioned attaching electric propulsion modules for end-of-life disposal of other satellites. Could such a module be added to Cygnus itself for boosting other payloads, perhaps with bigger solar arrays added to the Cygnus? Can Cygnus be used in deep space? EDIT: Also, what's the on-orbit life of the Cygnus? Could it stay at GSO for years, servicing or deorbiting satellites on-demand? Orbital Sciences has issued its May 2010 progress update report for the Cygnus spacecraft. It can be read at http://www.orbital.com/CargoResupplyServices/. To commemorate the 65th anniversary of the Wallops Flight Facility, NASA will hold an open house on Saturday, 5 June 2010, from 10:00 a.m. to 4:00 p.m. (EDT). Orbital Sciences will have its Cygnus spacecraft on display. On that weekend, the NASA Wallops Flight Facility will also be hosting the USAF Thunderbirds as their homebase while performing in the nearby Ocean City (Maryland) Air Show. Practice day for the air show is Friday, 4 June 2010, with formal performances on Saturday and Sunday, 5-6 June 2010. More information can be viewed at http://www.ocairshow.com. I wonder why they say "up to 2000kg", if the actual design can hold 2700kg+. Anyway, I hope the cargo demonstration flight won't slip much further than Q2 2011 and that NASA won't stand in the way of Orbital packing the demo mission full of (low cost) supplies, like water, clothing and packaged food. The CDR included two Cygnus PCM configurations. 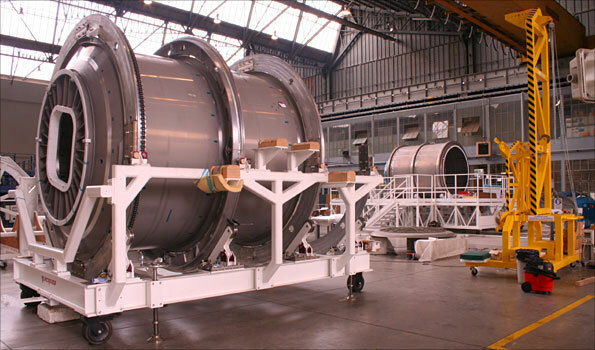 A standard configuration will carry up to 2,000 kg of cargo for the ISS, and will be used in the COTS demonstration mission in 2011 and the first two missions under the Cargo Resupply Services (CRS) contract between 2011 and 2012. An enhanced configuration will carry up to 2,700 kg of cargo for CRS missions between 2013 and 2015. A hypothetical question: Are there any plans or suggestions that Cygnus may have an optional configuration like that of the HTV with a much smaller pressurised module and an unpressurised cargo rack? The initial plan had unpressurized and pressurized variants. ISTR NASA has requested only the pressurized variant for early flights, where the initial plans had a mix fairly early on. All of this has been covered in the various Cygnus/Torus/Orbital threads. Just to let people know, I will be traveling to Wallops/Mars this weekend for an open house, most updates will be in L2 but I will drop a few nuggets here, and if anyone want to pose a question let me know. a Quick question for Dr Elias or anyone who might have the ability to answer, will there be a possibility to add or move the existing grapple fixture for SSRMS to the PCM+ ? It might save the ISSP some headaches for a few years as seen by a L2 document. The current Cygnus fact sheet (©2010 Orbital Sciences Corporation. FS006_08g) does not provide dimensions (other than volume) for the Pressurized Cargo Module. Yet those must now be set, as the manufacturing pathfinder article is well into production. Are length and diameter values available from some source other than the fact sheet? What I find hilarious is how the article goes to great lengths to show how much more sophisticated ATV is from its "American cousin" That may be true technically, but Cygnus is more robust operationally (Ie can lift racks, berth to multiple ports) for less cost.technology, isnt that a good thing? Bla bla to explain why you are spending so much more (tax) money on ATV. People could compare apples to oranges and ask why Cygnus is cheaper. You can't really compare the two since they are built to completely different requirements. ATV has a smaller hatch because it docks on the Russian side but that gives it reboost capability, can make it dock autonomously and allows it to deliver fuel. Both do what they were designed to do (well, Cygnus WILL hopefully do what it is being designed to do). Is an iPhone more advanced than, say, a Dell notebook? Or the other way around? ISS is an international cooperation. You have a set of overall functions that have to be available to operate it but not every system (supply vehicle in this case) needs to fulfill all of them. What I find hilarious is how the article goes to great lengths to show how much more sophisticated ATV is from its "American cousin"
How is it "American" if it is being built in Italy?